About Us -- Brenneman Excavating Inc. is your source in northwest Ohio and Lima, Ohio for mrmanhole, mrmanhole.com, manhole repair, excavating, Lima excavating, Lima Ohio excavating, excavation, Lima excavation, Lima Ohio excavation, site development excavating, subdivision excavating and pond digging. Brenneman Excavating Inc. has been your excavating source in the Northwest Ohio area since 1997. Brenneman Excavating can quote on commercial and residential excavating projects. Brenneman Excavating specializes in a variety of projects including site development excavating (parking lots & underground utlities), subdivision excavating (street construction, sanitary sewers, water lines & storm sewers), septic systems and manhole repair using the Mr. Manhole Leveling System. 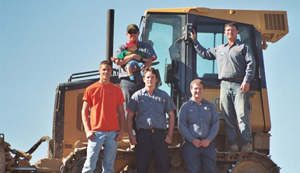 Brenneman Excavating is known for quality, relationship and trust. Call us at 419-339-3613 or Email us for a quote today. Copyright 2007-08, Brenneman Excavating Inc.